On the field, D.C. United got a dream opener at Audi Field, though the there are still some kinks to be ironed out before the team's next home game. 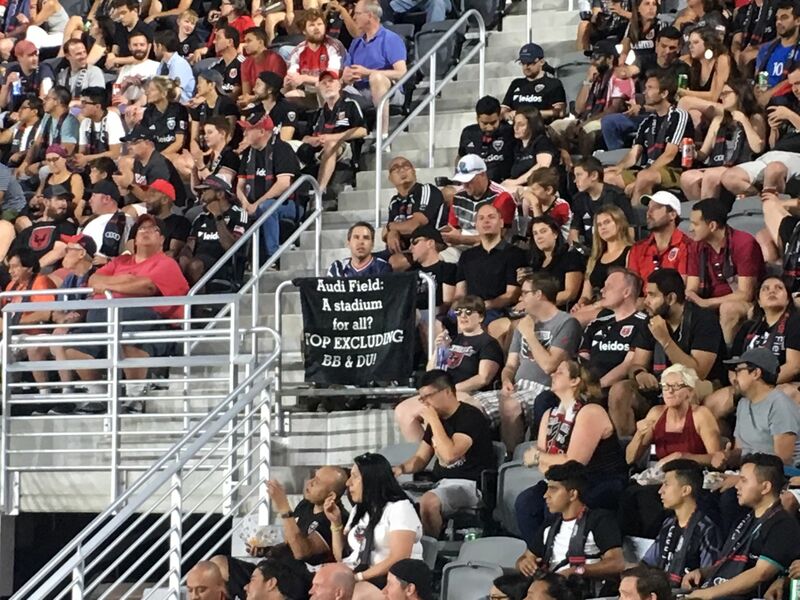 WASHINGTON — D.C. United stepped onto the grass at Audi Field Saturday night needing a win and three points in the worst way. 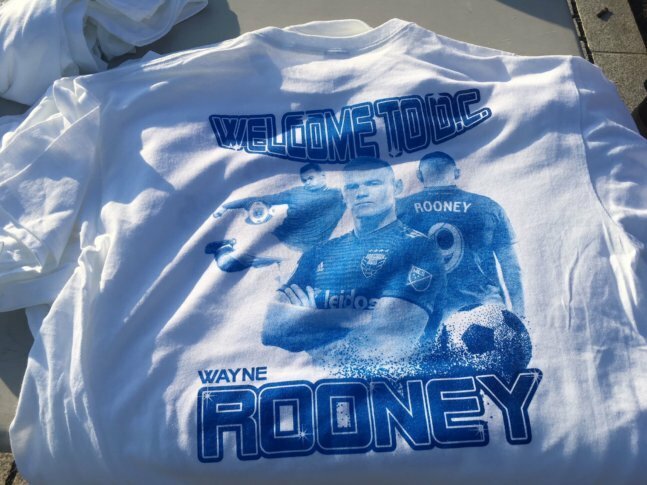 They got a dream performance, with three quality goals and a successful debut of new star Wayne Rooney en route to a 3-1 win over the Vancouver Whitecaps. Yamil Asad scored the first goal in Audi Field history on a beautifully curled one-timer over the outstretched hands of the goalkeeper. Crisp passing from Rooney and Zoltan Stieber opened up Paul Arriola for the second goal, and Arriola rocketed a screamer home for his second and the team’s third to put the game on ice, earning the club its first win in six games, nearly two months prior. The rest of the story wasn’t nearly the same unqualified success, but more of a mixed bag. While some elements of gameday were a success, there is clearly room for improvement and some fixes before the next home match, a week from Wednesday against the New York Red Bulls. With a construction timeline tight enough that the team store was entirely unfinished as recently as the ribbon-cutting last Monday, there was question as to whether every aspect of the stadium would be fully ready for the opener. In at least one instance, that was not the case. A piece of railing fell from section 111, reportedly grazing the head of team sideline reporter and public relations director Lindsay Simpson, landing on her shoulder. A team representative told WTOP Simpson was not seriously injured and was treated on site. Railings around the upper deck were duct taped as a precaution against other incidents. Those are the RFK-like incidents the team is desperate to leave in its past. But one well-loved vestige of the old stadium successfully made the transition to Audi Field: Factoria Maria Pupuseria. Started by a Salvadoran couple as a roadside concession for local soccer games around the D.C. area in 1990, it became a favorite of D.C. United front office members, who would ride a golf cart down from the front office to buy pupusas and steak and rice. Eventually, the team offered to bring them to RFK, where a single stand blossomed into five. But with the team moving, the future was unclear. 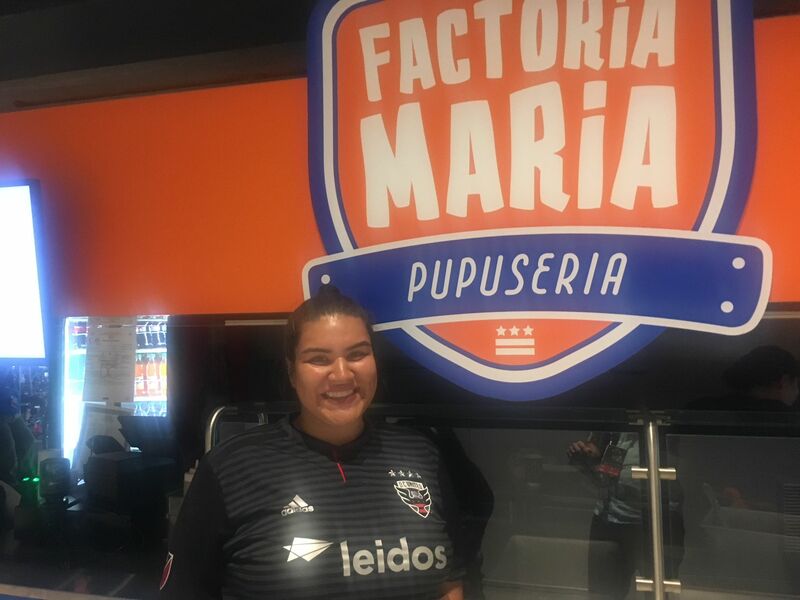 That got the attention of Jose Andres, who has a large presence among Audi Field’s concessions, and who worked with the pupuseria to build its branding for the new stadium. There are three stands, one behind each goal and the third up behind section 109, where Polio was stationed all night, serving big crowds of familiar faces. “Today was amazing. We had a lot of our loyal customers come. I even had some customers come find me, specifically … I wanted to cry. I don’t think there’s anything better than cooking for people, making them happy, especially at a soccer game,” she said. As some of the team’s loudest fans were outside protesting the game instead of cheering the team on, there was some question as to how the atmosphere inside the stadium would change. Early on, the results were discouraging, with an on-field host trying in vain to pump up the crowd before the game. The team didn’t do itself any favors by absolutely blasting the public address system, which was so painfully loud during the national anthem that the sound was actually cutting through the speakers. Sometime around the 10-minute mark, a fan standing in the Heineken rooftop bar in the northwest corner of the stadium spotted former D.C. United and U.S. Men’s National Team coach Bruce Arena down below, a handful of sections over, and began heckling him about the national team’s failure to make the World Cup this summer. There was so little ambient crowd noise that the heckler’s voice rung out loud and clear, drawing the attention of fans for several sections along the lower level on the East side. The crowd started finding its sea legs a bit once Rooney made his debut and the team pushed a second, then a third goal across. But the time between the big moments was subdued, with much of the stadium content to watch passively and the supporters section somewhat muted in the background. Ever the winking diplomat, head coach Ben Olsen’s postgame remarks about the crowd told the story. There were, as one might expect, some logistical issues. The move to all-digital tickets for Audi Field is nothing new for Ticketmaster, which has implemented the technology in over 130 venues. The switch has obvious marketing benefits for the organization, helping track their customers’ habits more precisely. “The core of digital ticketing is not only to produce a more seamless ticket experience, but also to reduce fraud,” Justin Burleigh, Chief Product Officer for Ticketmaster North America told WTOP. It’s also a major change for many fans. That’s why the company stationed representatives all around the neighborhood near the ballpark to try to help prepare fans, encouraging them to download their tickets to their phones in advance. Some who didn’t do so before reaching the stadium grounds, though, found themselves unable to access the information they needed to get inside the door, as wireless internet was nearly nonexistent right at stadium grounds in the hour leading into kickoff. But those who made it inside seemed to be avoiding other major logistical headaches. Despite narrow upper concourses, there weren’t logjams, and concessions and bathroom lines seemed reasonable. Each level was relatively easy to access, and even the cheap seats offer good views. Providing better internet available to the public around the entrance seems like it would fix the issue quickly and save future headaches for fans.